The world is full of scopes to earn a livelihood, what matters is SATISFACTION. Human beings crave for everything more while being in their own comfort zone. The “more” here definitely means “money” and comfort zone is “being one’s, own boss”. Maximum employees around the globe are stressed working under pressure and fed up meeting deadlines. This situation is actually disheartening for every employee who drags himself to the corporate world daily and ends up getting least in return. But, there are many jobs which are less known by creative minds to opt for, where the stress level is absolutely low and the incentive is comparatively high. These jobs basically demand creative heads where talent is all one need to showcase. 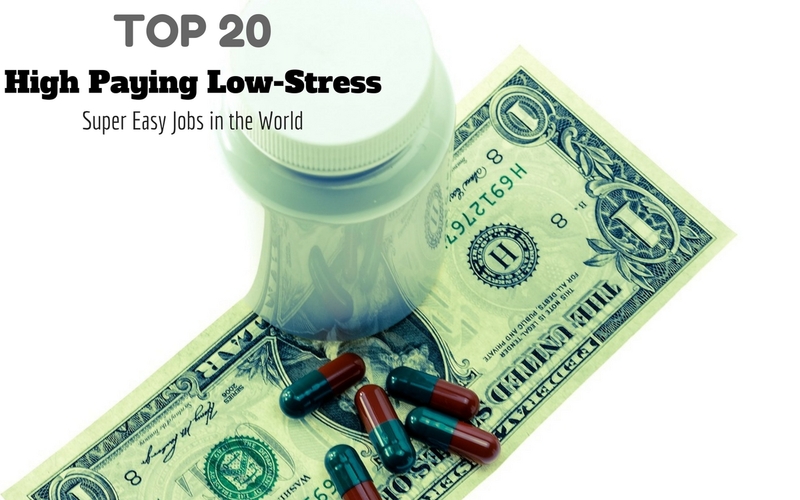 Below are 20 plus such awesome job profiles where “pay glitters “and “stress flickers”. Creative writer crosses the boundaries of usual academic contents and creates his own space of creativity in the world full of plenty of other content or technical writers. From fictional content to non-fictional write ups including lyrics as well as poetry creative writers’ work like a pro in their genre. The stress level here is very low as it’s a game of wordplay. The pay of a creative writer extends from $29,380 to $61,240 on yearly basis. The job of a fashion designer is to showcase his/her idea via designs using the most powerful asset that is his/her mind, on designing high-quality fashion clothing. People around the world especially women are crazy for finest designer clothes. The art of designing is the most creative and stress less activity in the world. A fashion designer balances the traditional and the modern trend, being precise in their work. The stress level in this profile is just the call of Showtime. Fashion designers earn a handsome amount extending from $64,530 to $90,050 though it depends. Photography is the art of capturing the usual phenomenon in the most creative form. There are several genres in it such as wildlife, street life, aerial, portrait, wedding, abstract, fashion photography, etc. All these categories demand a creative head who explores the usual in an unusual way. The stress level here is the least since the photographer loves to click, it’s like a hobby which he has engaged himself to freeze the beauty which he witnessed. The pay scale of a photographer can be anything according to the project still in an average it is from $ 18,850 to $72,200. The choreography is the most beautiful, healthy, stress-free job. The job of a choreographer is to teach the moves to a bundle of interested participants. This profile is extremely beneficial in all the ways from pay scale to fitness factor. The choreographer needs to know all the basic category of the dance form or any one if he/she is specialized in. This job is never stressful for the professionals as they love to dance themselves. The pay scale of a choreographer depends from $42,110 to $71,180. This job is a fascinating one because the technocrats explore the world of imagination and brings it into gaming. The game designer brings the virtual world and characters in such a way that other people can control that object. Ever since the comics and cartoons series came into being, the designers in no time got them into the gaming sector. The techno head who designs is the best player as well because he know every trick and tips. This profile is also stress relief zone for the players. The pay scale of game designer extends from $45,320 to $129,300. This job profile has nothing except directing works regarding designs, layouts, and formats of the art piece or pictures in the magazines or movies. The art director has to do justice with the visual style and effects of the piece given by the client. The job profile includes the task of visual communication to appeal the audience. The Job is less stressful since it’s a commanding task. The pay scale of an art director is anything near $53,450 to $72,490. This job deals in evaluating financial risk and analyses the data on statistics basis to predict the future events or changes in the corporate organization. This profession has been ranked as one of the most favorable career aspects. One needs to know the mathematics and the probability concepts. This job is basically zoned in the insurance sectors. The stress is limited as a mathematician always finds a way to “hence proved” thing. The pay scale of an actuary extends from $50,350 to $93,680. This job profile needs an excellent candidate who masters the art of cooking. The experiment is the key to success for this job profile. A chef needs to excel the art of cooking by experimenting with the food and giving it an incredible taste. The restaurants are always full if there’s a good chef in the kitchen. The stress is least except for the rise in demand for the food, which always makes a chef happy. The pay scale of a chef is close to $12,229 to $65,889. This is the best job for social media worms. The celebs, politicians and other delegates are busy with their daily activities, which makes it difficult for them to update their followers with the hourly feeds. Hence, they appoint a manager for their account to update all the needful. The manager must know all the dynamics of the very media and should be a technocrat as well. The stress here is almost nil. The pay scale of social media account manager is from $33,500 to $55,000. Their primary job is to provide the company good reputations and recognition in social media platforms from engaging people to reaching as many people as they can including Facebook, Twitter, Instagram etc. They also need to work with different members of the team with brand journalist and content writers as they are co-related. They play a huge role in marketing the contents. The workload is not high, so one can do the same work sitting at home also. They handle the multimedia communications with the customer which in return helps the company to know more about the customer’s likes and dislikes. This helps in company’s future marketing strategy. The pressure is not that high but the pay is good if the result is good. This is the most glam sham job for an individual which gives him almost everything, from money to fame, an actor gets a luxury life statement. This profile needs acting skills, performance and a face which speaks and expresses the unsaid words. The stress level here is low because an actor knows how to enact the play. The pay scale of an actor extends from $44,000 to $99,550 and even more. This profile is one of the top paid jobs in the world. This job demands a technical head who knows modification of software prevailing in the computer or mobile phones. Software developer develops various applications for the smooth running of the gadgets. The pay scale of system software developers ranges from $61,000 to $143,300. This job is famous in the western world for healing various distress among the population. A music therapist is supposed to heal its client from emotional, physical, mental, social sufferings using music media. This has two forms active and receptive. The therapist needs to know both in order to heal the clients. The stress is literally nil as it is a form of stress-free practice. The pay scale of a music therapist extends from $28,020 to $71,790. This job hires wanderers who actually bears the passion of a nomad. The person is supposed to travel around the places and explore, discover and blog post the details of the place. Sharing his experience of that very region. This is a stressless job for a traveler since he is ever ready with his bag packed. The pay scale of a travel blogger extends from $50,000 to $73,000. The job profile is assisting a dentist in examining and cleaning oral areas. Helping the dentist in applying fluoride and other medicinal essentials for the treatment of the client. The stress level is low as the major work is to be performed by the professional. The pay scale of a dental hygienist is from $45,650 to $72,730. The job here is to treat the patient in treating hearing disorders, fitting hearing aids and conducting research on hearing problems. They have to provide auditory training as well. The stress is based on working hour. The pay scale extends from $45,000 to $77,420. This job requires a candidate who is supposed to study the flow of water through the earth’s layers. They are entitled to solve problems in the areas where there is less availability of water through study. The stress level in this job profile is limited. The pay scale of a hydrologist can vary from $63,400 to $83,440. This job is offered to those who has a keen knowledge of the political system. The candidate should be very well acquainted with the operation of political science. One has to study the origin and development of the whole political system. The stress level is confined to study and research. The pay scale of a political scientist extends from $67,089 to $103,210. This job profile needs the application of knowledge of engineering technology and biological science in any agriculture concern. To sort the problems like soil and water conservation, processing and various power and machinery related activity. The stress level is based on work mode period. The pay scale for this job is around $66,000 to $78,490. This job is again one of the most paid jobs across the world. The candidate should master the art of Photoshop. Adding effects and editing skills are the priority aspects in this job profile. A graphic designer has to assemble the images or motion pictures to end up in creating one catchy piece for the client. One needs to be a pro in his editing skills. The pay scale of a graphic designer extends from $89,990 to $4, 56,206. The managing editor is the head of content writing and content marketing department and also manages them. He/She has to look for right things in the content from images to videos to the keywords. They should have the ability to handle deadlines for each project. And have a positive outlook in interpreting analysis and organizing a team. Search Engine Optimization is one important job for each and every website which needs a presence on the internet. They help websites to rank higher in search engines results so that they can get more traffic to their sites. It is also a work from home type of a job with low work pressure but with a very high pay. A video marketing manager’s job is to create and take interviews, see testimonials and demos on other storytelling artistic videos and buy them or creates own ones and make an impact with that video. The more the video with be appealing, more the business. Today’s world follows their passion and has a zeal to showcase their potential from their comfort zone, following the track of “smart work” than “hard work”. The concept of hard work is changing, ever since the development of technology. There are plenty of stress-free jobs, if no, then one can definitely create for others. The stress-free environment is a must in the current world where 2 out of 3 people are suffering from depression. Hence, these were some of the most incredible jobs around the globe offering the creative minds to earn handsome money and satisfaction as well.